Product information "HAIX Airpower XR2"
Built with an ultra-light composite toe, HAIX Airpower® XR2 men's EMS boots offer the ultimate in toe protection and comfort with its roomy toe box. It offers chemical and bloodborne pathogen protection, and electrical hazard protection. NFPA certified for emergency medical operations for the EMS responder, the Airpower® XR2 are also ASTM certified electrical rated boots. What more could you ask for in rescue boots you can also wear in the station? The HAIX Airpower® XR2 men's EMS boots feature a CROSSTECH® inner liner which allows your boot to be not only breathable, but durably waterproof. Not only that, the breathable inner liner works together with the HAIX® climate system to keep your footwear dry and comfortable in hot or cold weather or on wet or dry days. No worries when having to work out in the rain or at a messy accident scene, your footwear will keep you protected and comfortable on all fronts. The heat resistant soles of the HAIX Airpower® XR2 are extremely slip resistant as well as resistant to oil and fuel. Accident scenes, especially ones that involve vehicle fires, are not an issue as you don’t have to worry about your soles melting on hot asphalt or worry about exposing your soles to fuel and oil leaks. HAIX® Airpower soles keep you sure footed so you can focus on doing your job. HAIX®’s patented Secura Liner® feature protects you from the irritation of liner pull out. Your inner liner stays securely in place since it is sealed along with the leather beneath the sole, and is not a “sock” that is glued in under the insole like you see in other boots. No other boot manufacturer offers this unique feature. Nothing worse than having your liner come out of the boot along with your foot. HAIX Airpower® XR2 is your first choice for a Station/EMS safety electrical rated boot. Related links to "HAIX Airpower XR2"
Customer reviews for "HAIX Airpower XR2"
I ordered a new pair of boots and had them within 3 business days. The price was lower than any other distributor. The only negative is the cost of shipping. most comfortable boots ever. Only bad thing i have to say is the zippers and laces do not hold up well to being warn multiple shifts a week. Thank you for taking the time to review the Airpower XR2. We are happy to hear that these are the most comfortable boots you have ever worn. We do apologize that you have had some issues with the laces and zippers, but after reaching out to you, I believe we found a solution for you. We hope you will remain a loyal HAIX customer in the future. Stay safe out there! The best boots I have ever put on!! Boots are awesome. Nicest boots I've ever owned. Only problem the zippers don't seem to stay up with the velcro. Every 10 minutes i have to Re zip both boots. The other day I broke a zipper in half so now I have a zip tie to grab onto. Otherwise awesome boots, just wish the zipper and tongue were better. We appreciate you taking the time to review the Airpower XR2. We are happy to hear that these are the nicest boots you've ever owned. We do apologize that you have had some issues with the zippers, but after reaching out to you, I am confident that we found a solution to the problem. Thanks for your service! Stay safe out there! Been using these for years and last year my best pair got ruined in the Texas floods. I just got a new pair, and they are better then ever. Feet do not sweat and they are very comfortable after the first two weeks or so. The do have a break in time. Got my boots and have worn them for a rotation and they are really comfortable even without being broken in. It took alittle time getting the laces adjusted so both boots felt the same. I was worried about the zipper being a problem after some of the reviews but mine are smooth and zip up and down easily. From the moment I put them in they were comfortable. With one adjustment to the front zipper it has been amazing. I am an EMT for a busy Hospital based EMS system and on my feet most of the day. I was recommended these boot by my co-workers and I have recommended them to others. Only had the boots for a little while but love them already. They are super easy to get in and out of which is great for working EMS. After a 14 hour day my feet come out of the boots dry and not sweaty compared to my old issued magnum boots, and very comfortable. Definitely will buy again if I need to. Best and most comfortable boots I’ve ever had. I have tried many different boot styles and brands and these by far are the most comfortable. The zipper also works perfect without and hang ups. To be so expensive and highly recommended I haven’t had mine much over a year and the soles are separating and stitching failing on back loop color and the leather has cracked very unhappy with the outcome after such short use. Thank you for your feedback on the Airpower XR2. We apologize that you are not happy with your purchase. The service life of the boot depends on many factors. How often you wear them, for how long, what kind of work you are doing, do you clean and polish them regularly. Some people can get 5-7 years out of a boot because they work for a department that isn't very busy, their work isn’t very rigorous or because they do regular care and maintenance on their boots. Also, if these problems started happening before the year was up, this would likely be covered under our one year manufacturer’s warranty. We do partner with a company called NuShoe that uses all our manufactured parts to refurbish our boots. You can find out about their services at www.nushoe.com. We hope this won't deter you from trying HAIX again in the future. Stay safe out there! They’re still brand new as far as boots go so we will see how they stand the tests of EMS. So far they have been quite impressive. I’m on my feet for most of my shifts and these boots have proven to be quite comfortable given the summer heat and heft of the boot. The quality of the boot is 10/10 although I was a little disappointed to see a black zip tie that is supposed to be left on the boot. For $300, that put me off but as long they work, I can live with it. Boots are truly comfortable. They are well made. Easy to get on and off. Protect my feet. Support my ankle. With some care these will last for years. I pulled out the insole and replaced with green superfeet for even more comfort. Pair these boots with smart wool socks. It is 102F outside and my feet aren't soaked in sweat and they don't stink. Only negative is I have is that I've got skinny ankles and cant get the laces tight enough. Awesome boots and customer service to match. I bought these boots to replace an old pair that was discontinued. The old pair was the first pair of Haix boots I owned and I loved them. They lasted me about five years without major issues. The XR2's, however, started to have issues with the toe cap coming apart and the leather separating from the sole. One day, the zipper pull snapped off in my hand one day while trying to zip the boot up. I contacted customer service at once. Costumer service was very prompt and friendly. The representative asked for a couple pictures, determined it was a warranty issue, and had replacement boots in the works for me within the hour. I could not believe the level of customer service I received from this company. The customer service alone has made me a Haix customer for life. After having them for over a year I still think these are hands down the BEST boots I've ever owned. I work for a VERY busy fire department (20,000+ calls for service per year) and run about 15 calls per day in these bad boys and STILL haven't needed to recap the toe or resole them. My only two complaints: 1) the zipper gets caught in the leather under the zipper but trimming this back has solved that issue and Haix will tell you you can do so without voiding warranty (awesome customer service... especially for a $300 pair of boots) and 2) when I go from sitting to standing my pants get caught on the pull tab on the top rear of the boot above the heel. It's a mild inconvenience and I can't exactly trim that off but I have found that wearing pants with an extra half inch in the hem for the most part resolves this, there's just a slight bagginess to my pants then but it's no big deal. Long and short between the product itself and customer service, these are likely the last pair of boots I will ever buy. Or at the very least the only company I will ever buy station footwear from. Ive had the XR1s for about 4 years now and there the best boots for firefighting/ems I just bought the XR2s and will be switching off between pairs best boots on the market. These boots are a solid boot. They are light and functional and very comfortable. I purchased a pair to try in the construction line of work and they are great. That being said I have a few issues with them though. 1. The zipper catching the leather, this seems to be a huge issue that a lot of people are reporting. I don't need to go into detail with this one as its been done already. 2. The heel portion of both boots got very uncomfortable after they were subjected to water and dried. They curved inward and dug at my heels until they bled. This isn't the first boot to do this to me though, I've had many high end boots do this until they are broken in. And finally the one that actually lowers this boot to a 6 of 10 for me. 3. Waterproof. What is waterproofing? These boots claim to be water resistant and have a water proof inner liner. My socks are damp about 3 hours into my 12 hour shift and wet by the end. That being said, it's not like water is running through the boot but that the liner is continuously damp. I work in snow and mud a lot and these boots aren't cutting the weather. Thank you for your feedback on the Airpower XR2. We are happy that you like the fit, comfort and functionality of this boot. We are sorry to hear that you have you have had issues with the zippers and waterproof feature of these boots. This could be considered a warranty issue. Please contact our Customer Service Dept. at 866-344-4249 so they can help find a resolution to this issue. We hope you will remain a loyal HAIX customer in the future. Stay safe out there! These are best boots that bought. I work 12 hours shift and they very comfortable when wearing. These are easily the most comfortable boots I've ever owned. I love the front zip as well as the build quality. The only issue I have found is that the zipper sometimes catches on the leather on the back, but if you simply pull the zipper back up it usually releases easily. I have also found that the straighter the zipper path is (by pointing your toe down) the less chance of catching. Even taking that into consideration these are the best boots I have ever worn. Thank you for your feedback on the Airpower XR2. We are happy to hear that these are the most comfortable boots you've ever had and that you like the front zip and the high quality craftsmanship. We apologize that you have had some issues with the leather catching. You can also cut it back without voiding the warranty. But we appreciate the suggestions for alleviating the zipper issue. Again, thank you for your comments. We hope these boots continue to serve you well in the future. Stay safe out there! This is my second pair of these boots, my first pair I had lasted me for a few months before they started to squeak and I did everything I could to get the squeaking to stop, I contacted Customer Service who were more than help by sending me another pair since my first pair were under warranty still. This pair now has given me no problems so far and I hope it stays that way! Best boot I've ever worn! Highly Recommend! Thank you for your feedback on the Airpower XR2. We apologize that you had a squeaking issue with the first set of boots. But we are glad that it was resolved and that the second pair is serving you well so far. We are pleased that you are happy with the boots and with the service your received. We hope you will continue to be a loyal HAIX customer in the future. Really like the feel of the boots and the toe cap but I'm having the same problem that others have commented about. The zipper is getting stuck on the leather on the back side and will not undo and this is something that needs to be fixed ASAP as the boots are unwearable like this. I have had a new pair of Haix almost every year and this is the first time I have had a problem in 6+ years. I'm missing the bigger lip on the back of the boot heal like the Airpower R2 it made it more convenient to get out of in a hurry. We appreciate your feedback on the Airpower XR2. I apologize that you've had issues with the zippers. We do tell our other customers to cut the leather in the back (without voiding the warranty) and that usually does the trick. You can also add a little oil lubrication to leather heel counter for easier donning/doffing of the boot. After reaching out to you, I believe we have found a reasonable solution to your problem and we hope this doesn't deter you from being a loyal HAIX customer in the future. Honestly, one of the best boots I’ve tried. Super comfortable and durable. Only problem I ran into was the zipper getting caught on the leather on the backside of the zipper, and during a emergency like having to jump into turnouts, this is problematic. I hadn’t had the problem while going out to a call yet, but a couple time before and after shift. We appreciate the positive feedback on the Airpower XR2. We are happy that these boots are comfortable and durable on the job. We apologize that you've had an issue with the zipper but I believe after getting in contact with you, that we have found a suitable solution to the problem. We hope this works and that you will remain a loyal HAIX customer in the future. This is my 4th pair of Airpower boots, each of which has lasted 2-3 years (I put a lot of miles on them). Over this time, each new pair has had numerous incremental improvements over the previous ones, so that I'm happier with this pair than I was with my first. Great grip on the soles, great protection from everything at wrecks, comfortable, and quick to get on and off. I see others are complaining of difficulty with the zipper but it only takes a little adjustment of the laces to solve that problem. We appreciate your feedback on the Airpower XR2. We are glad that you are getting a lot of mileage out of these boots and that you appreciate the improvements we continually try to make to give our customers the best product we can. We are happy to hear that you like the grip of the soles, protection, comfort and the quick on/off zip feature of these boots. We appreciate your service and your loyalty to the HAIX brand! I am a firefighter / paramedic and tend to be very hard on boots. I usually get less than 1 year out of boots, so I decided to give these a try due to recommendations from coworkers who have been able to wear Haix boots for 3+ years. I really like the style of the boots, and can tell that they are well made. My only complaint, which caused me to return them, was the seam where the toe cap meets the leather inside the boots rubbed uncomfortably on my toe. I ended up trying a 13, 13.5, and 13.5w all with the same issue. (I normally wear a 13) I would recommend these to anyone as long as they fit well. Unfortunately, they didn't work for me. We appreciate you taking the time to review the Airpower XR2. We are glad that you considered the HAIX brand after recommendations from co-workers. We apologize that they did not work out for you. Everyone's feet are different and every once in a while, a customer just can't wear a certain style of our boots. If you decide to give us another try, a different model may work out better for you. Again, we thank you for trying to make these boots work and hope you will consider us again in the future. Thanks for your review of the Airpower XR2. We are glad that you find these boots to be durable and that they have held up well while on duty. We are sorry to hear that you've had some issues with squeaking and with the zippers. We stand behind our products and these issues are likely to be covered under the one year warranty. Please contact our Customer Service Dept. for further assistance with this matter. We appreciate your service and hope you will consider HAIX again in the future. Thank you for your feedback on the Airpower XR2. We are happy that you like the design and comfort of this boot and you have found them to be sturdy and durable. We apologize that you have trouble donning/doffing the boots. Hopefully with more time and practice and as the boots break in more, you'll be able to get them off and on quicker. We appreciate you sharing your comments and concerns. Stay safe out there! Thank you for your review of the Airpower XR2. We are happy to hear that the boots are comfortable and you've had no issues with the zippers. We hope these boots continue to serve you well in the future. Stay safe out there! I have had these boots for about 4 months, I wear them every day Mon-Fri for 12 hours a day. The first problem was the zippers, which is Obviously an issue, this was fixed by a pair of scissors cutting the extra leather from behind the zippers. The second issue is the insole, it has minimal padding or support and has bumps in weird places for my feet, Problem solved with a good pair of insoles, 3rd issue is my big toes rub on the inner part of the toe cup I adjust my foot and it seems to be better. I bought these because many of my co-workers had them and love them. I will keep them and swap off with my Danner Acadia's which are the most comfortable boots I have had in my 34 years in EMS. These have more certifications and bells and whistles, but still not #1 yet. We appreciate you taking the time to review the Airpower XR2. We apologize that you have had some issues with the boots. Cutting the excess leather behind the zippers is actually a solution that we suggest to other customers with the same issue, so we are glad that you were able to make that work for you as well. As for the insoles, we are sorry that they were not comfortable but it's good to know that you were able to fix the problem with another pair of insoles that were more to your liking. As far as the rubbing issue, this may be because the sizing is wrong or they just needed some added break-in time. Our boots often require a little longer to break in due to the full-grain bullhide leather used throughout. I will certainly pass your concerns up the chain of command for consideration. We hope this will not deter you from considering HAIX in the future. Thank you for service. The boots are probably the most comfortable and stable boots that I've worn in my Fire/EMS career. Clean up great and are definitely slip resistant. The only problem that I've been able to find so far is the zippers bound up a couple times but then after a month of wear the left zipper broke. There is definitely room for improvement on the zippers. Aside from that, no doubt I will continue to wear these in the future and plan to expand with other offerings from the company. Thank you for taking the time to review the Airpower XR2. We are happy to hear that the boots are comfortable, stable and slip resistant on the job. We apologize that you had some issues with the zipper but after reaching out to you via email, I am confident that we found a reasonable solution. We appreciate your business and hope you will continue to be a loyal HAIX customer in the future. Usually I would start a review by listing all of the benefits of the boots. Though; they have a single fatal flaw that renders these boots completely unusable. THE EXCESS LEATHER BINDS UP THE ZIPPER AND RENDERS YOU UNABLE TO REMOVE THE BOOT. Normally I would discount this as a defect but after having read the reviews more in depth, this is an extremely common problem with these boots. The boots themselves look nice and feel fairly comfortable on the feet. Before you buy these boots, I strongly recommend that you consider how much time you are willing to waste donning and doffing these boots. If you need a pair of boots that take you less than 15 minutes to peel off then these are not the boots for you. The quality of leather and stitching on these boots are good; the materials used are excellent overall. In addition to the zipper problems rendering these boots completely useless, the lace holes on the zipper tab are unevenly placed. But, my favourite part about these boots is that the zipper tab is secured to the boot by highly visible 3¢ zip ties. Overall, I am very disappointed with these boots, especially for the price. If you are spending $280 on a pair of boots, you shouldn't have to take a 50/50 chance that you cannot get the boots off you feet because the zipper binds up. I have owned many pairs of 5.11, Blauer and Danner boots and will honestly say that these boots are by far the most frustrating and disappointing boots that I've ever owned. So please HAIX fix this massive zipper problem and stop sending your highly paying customers subpar boots. Thank you for taking the time to review the Airpower XR2. We apologize that you have had some issues with the zippers which makes the boots hard to get off and on in a hurry. But now that we've reached out to you through our Customer Service Dept., we are confident that we have found a solution to your problem and we hope these boots will serve you well in the future. We appreciate your service and for contacting us so that we could resolve this matter and get you back in our boots! 2nd pair I've owned. Had the last ones for 10+ years. Love the comfort and fit. My department buys our boots but not this brand and style. Coughed up the money out of pocket because I love them so much. Would give a 10 but, super unhappy with the zippers. Both continually got stuck in the leather underneath. Sometimes you have to get you boots OFF fast too. Actually had to cut excess leather out of the zipper assembly after fighting my boots to get them off and change into turnout gear. Thank you for your review of the Airpower XR2. We are glad that they are comfortable and fit you well. We are also happy that you chose our boots over our competitor, even paying money out of pocket. We appreciate your loyalty! As for your concern with the zippers, we are sorry to hear that they have gotten stuck underneath the leather and that you had to cut off the excess to be able to use them. We hope this solution helps and that the boots serve you well in the future. Most comfortable boots I've ever worn. I've had my XR-1s for 9 years and they fit as well today as the day I bought them. No problem wearing them on 24hr shifts. I'd consider buying a new pair but resoling has kept them like new. We really appreciate your feedback on the Airpower XR2. We are happy to hear that our boots have served you well over the years and hope they continue to do so in the future. We are also glad to hear that you have taken advantage of the extended wear program to get the most life out of your boots. Thank you for your service and your loyalty to the HAIX brand! The boots are good. They fit a little snug and are difficult to get properly adjusted. The customer service was not helpful concerning resolving issues. Thank you for your review of the Airpower XR2. We are happy to hear that you like the boots. I apologize that Customer Service was not more helpful in giving you more information about fit and adjusting the laces. I have sent you some information that I hope you will find useful. Once you get the proper fit, we hope that these boots will serve you well. We appreciate your service! Thank you for your review of the Airpower XR2. I am sorry to hear that you have had problems with your laces but after reaching out to you, I think we found a satisfactory solution. We hope this will not deter you from being a loyal HAIX customer in the future. We appreciate your support. My EMT son loves these boots. I only gave it an 9 instead of a 10 because they came with a damaged tongue/zipper. Apparently they got a bad shipment in and ours was in that batch. Haix quickly sent us a new tongue, which we put in, with some difficulty. Their customer service is excellent and we've had no problems with the zipper since. My son says they're very comfortable. We appreciate you taking the time to review the Airpower XR2. We sincerely apologize about the damaged zipper tongues but I am glad that we were able to get a new one to you and that you haven't had any issues since. We are also happy to hear that your son loves the boots and thinks they're very comfortable. We do pride ourselves on customer service and I am pleased that we were able to help. 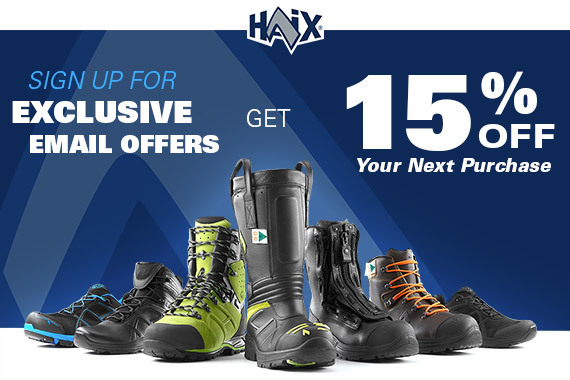 We hope you and your son will consider HAIX again for your next boot purchase. So I just want to say a quick thank you Haix! These boots are absolutely AMAZING!! They fit perfectly right out of the box with no problems what so ever. I was very impressed with how they looked, fit, and operated! The cost is up there I will admit but so worth the money! I would buy these boots over and over again! I would also recommend these pair to anyone who can afford them! Thanks again HAIX for your awesome quality products! We really appreciate your positive feedback on the Airpower XR2. We are so happy to hear that these boots fit perfectly right out of the box and that you have found them to be of high quality. Thank you so much for your recommendation and your future loyalty to the HAIX brand. Amazing boot and customer support! I wore this boots at work the day they arrived, very comfortable and my feet did not hurt at all that night or the next day! I had dumb luck with the zipper catching on the leather of the right boot, customer service took care of it in no time. The customer service representative was very nice and now I have a replacement zipper being shipped to me, wonderful service in a timely manner!! I will definitely be recommending these boots to my coworkers. Great job Haix!!!! Thank you for taking the time to share your feedback on the Airpower XR2. We are happy to hear that the boots have been comfortable on the job. We apologize about your issue with the zippers but very glad that our Customer Service Dept. was able to get that taken care of for you. We pride ourselves in providing the best service possible and it sounds like we delivered in this case. We really appreciate your service and your recommendation of our products! Have had these boots for about a month now. I work Fire/EMS and they have been very comfortable and are made very well. love how easy they are to shine. only complaint is that the top zippers seem to get caught on the fabric under the zipper when un zipping very often which means you have to either zip them back up then down again or pull the fabric piece out of the zipper which is annoying when trying to quickly take them off to switch into bunker gear. Thank you for taking time to review the Airpower XR2's. We are happy to hear that you find them comfortable and well made. I apologize about the zipper issue but I am confident that we found a solution that was up to your satisfaction. We appreciate your service and your loyalty to the HAIX brand. We appreciate your review of the Airpower XR2. We are happy to hear that they are comfortable on the job. We apologize that you have had issues with the zippers. Hopefully a set or replacements will help alleviate the problem. We hope these boots will serve you well in the future. Thank you for taking the time to give us feedback on the Airpower XR2. We are sorry to hear that you had trouble finding the correct size and that you had to return them for a second time. We hope you will consider giving HAIX another try in the future and if you have any issues with sizing, don't hesitate to call our customer service dept. or chat with us online. Do yourself a favor and fork over the extra money for these, if you're on the fence bite the bullet, you won't be disappointed. I have literally been wearing these since day 1, all day every day. No break-in period, lightweight, incredibly comfortable, craftsmanship is on point. absolutely zero complaints. Spend the time and get the laces just right and never worry about them again. I understand all the hype over these boots now and will be a customer for life! We appreciate you sharing your feedback on the Airpower XR2. We are glad that you have found them to be lightweight, comfortable and well-made. Thank you for being such a loyal customer. Thank you for your service. Stay safe out there. I can wear these all day! Great design, and the comfort is unmatched! We appreciate you taking the time to give us feedback on the Airpower XR2. We are happy to hear that you like the design of these boots and have found them to be comfortable out on the job. Thanks for your service. Stay safe out there! Like most have mentioned. These boots are comfy right outta the box. Slip on easily when you're on your way to a call and paired with good soles, you won't have any issues staying in them for the day. Only issue is that mine still squeak from the leather or whatever it is. Thank you for taking the time to review the Airpower XR2. We are happy to hear that you have found them to be comfortable and easy to slide on when going out for a call. You may want to use some silicone-based polish to stop the squeaking. Hope that helps! Thanks again! So good I bought 2 pair! The first pair of boots I bought were the XR1s. Using them for grass/brush fires I found out how comfortable they were, so I got a pair of XR2s for station wear. Great boots. You will not be disappointed. First of all, thank you so much for your loyalty to our brand. We are very happy to hear that you liked the Airpower XR1 so much that you purchased the Airpower XR2's as well. We appreciate your feedback and hope both pairs of boots will continue to serve you well on the job. I bought these boots from HaixUSA.com without ever trying a pair on which is something that is outside of my comfort zone. I've read numerous reviews and spoke to some people who have worn them. The only negative review that I ever heard was from a coworker who had problems with fallen arches and flat feet and that was resolved with an aftermarket insole. Now for my personal review and opinion; I've worn these boots for 12 hour shifts and have nothing but great things to say about the comfort, quality and overall design and appearance. They fit perfectly right out of the box. They seemed somewhat stiff the first couple of days but were by no means uncomfortable. After 3 or 4 shifts, they feel perfect. The composite toe provides protection without adding weight. I don't like the steel toe boots because of the added weight and the fact that they stay really cold in the winter and require thicker socks to keep your feet warm. These boots are also true to size. I normally wear a size 9.5 medium and ordered these boots in the same size and they fit perfectly. They take a polish and shine very well and I have not had any problems with them being weatherproof as I have used them in rain and snow and have always had warm, dry feet which is something that I can't say about other brands that I've worn (5.11 and Bates). They are not the cheapest boots around, however, you should consider how much time you spend on your feet and the level of comfort and protection some of the others provide. I signed up for the email newsletters and got a 15% discount code along with free FedEx Ground shipping. I had the boots on my feet less than a week after ordering them. The soles are quiet and do not squeak and provide solid traction on snow, ice and wet, slippery floors. I've had many complements on them and the only "negative" things I've heard from coworkers is the price. My response to them is that you just can't beat German engineering. Thank you for making a quality product! We really appreciate you taking the time to share your experience with the Airpower XR2. It is one of our top of the line boots and also one of our top sellers. We are happy to hear that you have found these boots to be comfortable even after working 12 hours shifts. We pride ourselves on making quality footwear and it is good to know that they are serving you well. Thank you for recommending these boots to your coworkers and standing behind our products! I love these boots so much that I bought a second pair to rotate them daily. They came out of the box comfortable. Flat out fantastic boots. Only one problem. The zipper on the right boot on both pair, bind up in the leather backing every time I unzip them. I have no idea why. It took me ten minutes one day to get the boot off. Again I have absolutely no idea why. Thank you for taking the time to give us feedback on the Airpower XR2. It is one of our most popular boots and we are happy to hear that you find them to be comfortable for work so much so that you bought a second pair! I am sending you two replacement zippers, so hopefully that will fix the problem. We appreciate your loyalty. I purchased these boots without ever trying them on, a behavior I don't like. I am a size 13 medium and wanted a zipper boot. I was able to get many years out of a Red Wing boot which I had to install the zipper myself. I was never able to get a secure tight fit. Anyhow, I needed a boot that already had the zipper in it. I wear my Airpower XR2's ten to 12 hours at a time. My feet do not sweat. The duty boots were comfortable from day one! I did not have to make any adjustments. I am not sure I would be able to figure out to tighten the boots if needed though. Haix includes a helpful packet that explains the boot tightening procedure along with other helpful information regarding the boot and it's maintenance. Overall, I have only had the boot a short time. I am very pleased so far. We are so happy to hear that you are pleased with your purchase of the Airpower XR2 and that you found them to be comfortable right out of the box. We appreciate you sharing your experience with us and hope the boots will continue to serve you well in the future. This is the second pair of boots I've bought. My first pair was in 2008 and still have another 2 years or more, and haven't been rebuilt. I wore them 20 or more days a month as a Firefighter/ Paramedic on a 24/48 shift. They show wear but I can shine them and they'll look brand new. This is one of the best pairs of boots I've ever owned. My girlfriend and daughter both have a pair for work. I love these and will probably never buy any other boots for working in EMS. Maybe this pair can get me to retirement. LOL I'm going to find out. GREAT BOOTS. Thank you Haix. Thank you so much for the positive feedback on the Airpower XR2. We are happy to hear that our boots have served you well over the past two years. We certainly hope this new pair will take you into retirement. It's also good to know that you have made it a family affair by getting your girlfriend and daughter in a pair of HAIX. We appreciate your loyalty and hope you will continue to be a customer in the future. Was impressed with how comfortable these boots were on day 1. So far so good. Thanks for giving us your feedback on the Airpower XR2. It is good that you found them to be so comfortable right out of the box. We hope they continue to serve you well in the future. The most comfortable and economic boot on the market. Will not wear any other boot. It's great to hear that your Airpower XR2's are working out well for you. We appreciate you taking the time to share your experience with us. Thank you for everything you do and for being such a loyal customer!